SAIL AREA: 748 Sq. Ft. In 1985 the chief designer of McCurdy & Rhodes designed this 38'6" FRP Cutter for himself and his family. She has raced in eight Newport-Bermuda races, finishing second in fleet in 1994, and sailed in one Marion-Bermuda race, finishing third in class in 2007. While not racing, she spends her time cruising between the southern reaches of the Chesapeake Bay and the St. John's River in New Brunswick, Canada. 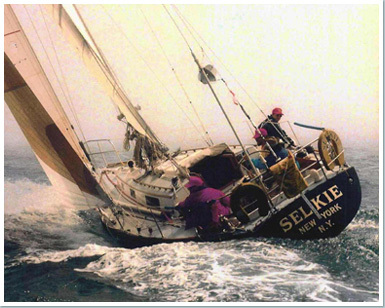 Selkie was designed for offshore and coastal cruising as well as for IMS racing. She was beautifully built by the Concordia Company, South Dartmouth, Mass., with a one-off composite hull. The hull form is configured for offshore sailing: less beam than contemporary racing boats and more draft than contemporary cruisers. Ballast displacement ratio is high, 48%, producing a 130 degree range of positive stability and fairly high displacement. Displacement length ratio is 295. The rudder is skeg mounted. Hull and deck construction is Divinycell cored with an outer hull skin of Kevlar arid S-glass and an inner hull skin and deck skins of Kevlar and biaxial E-glass, all vacuum bagged with epoxy resin. Construction has American Bureau of Shipping plan approval. Principal items of interior joiner work are plywood skins over honeycomb core. Finish inside and out is Awlgrip with teak trim on deck and cherry trim below. The interior accommodations are quite conventional and suited for living under sail offshore. The total number of berths is suppressed in favor of stowage space and an open main cabin. There is a Dickinson LP gas range and a Seafrost engine driven refrigeration system. The engine is a Westerbeke 46 driving a Martec folding propeller. Sailing instruments are Brookes and Gatehouse Hornet 4. Loran is Northstar 800X with a Rochester cockpit display. SSB radio telephone is TCOM M700 and VHF is TCOM M80C. All winches are Barient self-tailing. Halyard winches are on the mast. Deck fittings are principally Harken, as is the jib furling gear. Spars and standing rigging are by Hall Spars. The mast is double spreader with a baby stay and an inner forestay backed by running backstays. The storm staysail is carried on the inner forestay. Standing rigging is Navtec rod except for the inner forestay and runners which are wire. The permanent backstay adjuster is Navtec integral hydraulic. The boom yang is a Hall Quickvang. Selkie set off in the 1986 Newport-Bermuda Race two days after she was delivered and finished sixth in her IMS class of 33 boats. This was about six places lower than intended. Performance offshore, however, has matched intentions.